Campervan's and Motorhome sales continue to grow as do the variety of awnings giving these vehicles usable outdoor space. Styled very much like a caravan awning, this type generally slides into the track of a cassette awning or roll-out blind. 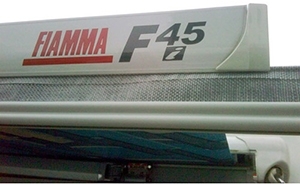 Cassette awning brands like Fiamma, Omnistor, Thule are the most common and the track is found either on the front casing or by winding out the awning slightly to reveal it underneath. The track size is commonly 4mm but you may find yours has a 6mm aperture. 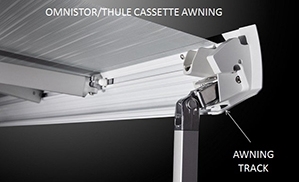 Conveniently Kampa Awnings supply their static awnings with both sizes of Keder tape (4 & 6mm), which simply slides into your cassette awning track. If you do not have a cassette awning on the side of your vehicle you may decide to have a track fitted. This awning track is most likely to be 6mm. Be sure to have this fitted professionally as simply screwing a track into the skin or shell of your vehicle may result in damage in high winds. A. The height from the track to the ground when the unit is closed. Static awnings (Motor) are made in various heights and it's imperative that you purchase the correct one. B. The distance from the top of the entrance door of your motorhome to the track of your cassette awning. You must have a clearance of at least 12cm otherwise the motorhome door will hit the roof of the static awning when opened. If you are purchasing an air awning and the air pole falls directly above your door you will require at least 20cm of clearance because of its diameter. C. The width of the cassette awning is also important. For example a 4 metre size will only have 3.90m of actual track. You cannot have any part of the static awning exceeding the track. Most static awnings nowadays are AIR or inflatable poles. This style is incredibly quick to pitch and take down and so very easy to use. There are available in a variety of styles, made in different widths, depths and heights. A great choice! Kampa static awnings generally inflate from a single point and come complete with a manual pump or optional electric 12V Gale pump is available. The trick to connecting a static awing to a cassette awning is to wind it down to a managable height, slide it on and wind it back. NB It's important for someone to take weight of the material whilst winding back otherwise you may damage the mechanism. Because most cassette awnings sit proud of the vehicle bodywork, a 'Motor' static awning is manufactured with a gusset of material that allows it, with the aid of poles supplied, to fit up and under thus creating a flush fit or seal. Fitting height sizes start at 235cm and some go up to 310cm for even the tallest motorhomes. Driveaway awnings are available in a variety of height sizes, styles and pitch sizes. Most are inflatable but there are still a number of poled awnings to buy. These fit in exactly the same way. The big difference is that you can leave these awnings on a camp site pitched, go out exploring for the day and return to reconnect it to your vehicle. Both Vango and Kampa have an impressive range of this style. They all have a connecting walk through tunnel that joins the awning to the vehicle and it is this part that disconnects and is rolled away when moving away from it. A. Most driveaway awnings come complete with straps or lines that go over the roof of the vehicle and peg in the ground the otherside. A tennis ball with a slit in it is an easy way to do this. With this application it achieves a reasonbly flush fit with the side of the vehicle and is quick and easy. Actual sizing or measurements vary according to the manufacturer and sometimes this style of fitting is not appropriate to a campervan with a pop top or pop up roof. B. Older VW's and similar have a rain gutter that runs around the perimeter of the roof and the tunnel can connect to this with Figure 8 Plastic Extrusions. If your vehicle has this then it's a solution to the 'Pop top' problem. The Figure 8 simply slides onto the Keder Tape stitched on to the roof of the tunnel and clips onto the gutter. Measurement of the gutter to the ground is your fitting height. D. The Kampa Limpet Suction Driveaway Kit is a solution to attaching the tunnel of the driveaway to a 'pop top' vehicle with no gutter. Just sucker material to the roof and connect the tunnel to it with the included Figure 8 Extrusion. The measurement from the roof to the ground is your fitting height in this instance. E. A Magnetic Driveaway Kit works in the same way as 'C' but only on vehicles with a smooth metal roof. Bear in mind that high wind may affect the way this works. Height measurement again is from the roof to the ground. F. A Fiamma/Omnistor (4-6mm) Driveaway Kit works with a cassette awning. Slide the double-sided Keder Tape into the track and that then connects to the tunnel with the Figure 8 provided. When you want to drive away just slide off the plastic Figure 8 extrusion. Easy! The measurement from the track in the closed position to the ground is your fitting height. The latter two fitting options, as with static awnings, you must consider the distance between the top of the motorhome door and the cassette awning track needs to be at least 12cm so the door does not snag the material on the tunnel. 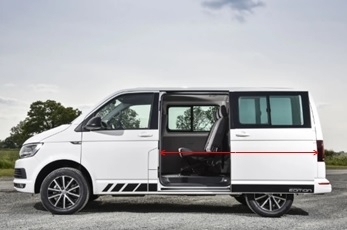 If you are fitting to a VW or similar vehicle with a sliding door please measure from the edge of the door frame to the point where the door hits its stop. This measurement must be within the connecting tunnel width otherwise you will not be able to open the door properly without unpegging the tunnel every time. Campervan/Motorhome awnings generally only fit on the side of the vehicle. There are only a very limited selection of those that fit on the rear of a van. As a rule Static and Driveaway awnings are for Touring Use Only (4-6 weeks per year). They are not designed for permanent or semi-permanent seasonal pitching or extended use in High UV areas in Europe. Kampa manufacture awnings in an 'All-Season' material for this very purpose and are designed to withstand UV degradation over a period of time. Please ensure you purchase the correct awning for the conditions you are likely to endure. 1. When available always purchase additional Storm Straps, like these from Vango. These will improve the stability of your awning in strong winds. 2. The purchase of footprint groundsheets or waterproof sheeting to place under you awning will protect its base on hardstanding pitches and keep it clean for packing up. 3. It's always beneficial to have a selection of pegs, particluarly hard ground pegs for hard standing pitches. These will not be included in your awning purchase. 4. When using the strap or line attachment method over your vehicle, a length of Pipe Foam Lagging cut into three and placed on the exit part of the roof will protect paintwork. 5. The use of a 'Runway Strip' marker will make re-parking/alligning back correctly to your awning a lot easier. 6. If your Campervan/VW has no fixings for a driveaway awning and you do not want use straps or lines then we would recommend you to have a Reimo Rail fitted. A neat and attractive version of the standard alloy 6mm track. 7. When maintaining your campervan/motorhome awning always use a recommended cleaner or simply warm water and a soft brush. Never use household detergents as these seriously affect waterproof coatings. 8. A draught skirt can be purchased and fixed with suckers (Limpets) to stop draughts coming under the vehicle. Partuclarly useful with 'Static Awnings' that have no back doors. 9. Never leave an awning packed away wet. Although modern materials do not require drying out immediately, unlike older canvas materials, prolonged damp conditions can cause deterioration in waterproof coatings, result in mildew and create bad odours. Remember air awnings can be inflated without a van to dry out. 10. Always familiarise yourself with pitching your awning before your trip, checking that all parts are present. There are loads of videos to watch on YouTube to make your life easier.